With all the snow melt and rain, the waters are all pretty high in the region. But if you like class IV rafting, it is a great time on the Dead River. The first release in on May 11th. Do you dare? Of course rafting trips are offered well into September. We no longer have a rafting company in Jackman but the Forks is only a 30 minute ride. Spend the weekend with us and then come back to your cabin after your ride to share your experience with each other while roasting marshmallows by a campfire. Spring, lovingly called Mud Season in Jackman has finally arrived. The first sign is the birds i hear in the mornings. A couple weeks ago, these small birds were all over the trees around Cozy Cove. Very chatty. Then as a group, they all take off and would move on to another set of trees. I wish I knew what they were. I assume they are migrating. A few days ago, I heard the woodpeckers calling, then of course, they found a couple trees to peck. Last night I saw 2 geese on our yard, which is actually almost a pond now) along with a duck or two. This morning again, a few more sounds of birds that I have no clue what they are. With the trees around camp here, I can not usually see them well, even with binoculars but I hear them. Romping around, mating or making nests. I have been watching for our tree swallows to start nesting in our many houses we have for them. None so far. So along with the signs the birds are giving us, the piles of snow are melting pretty quick. The melt runoff has caused the lake waters to rise also. Soon we will be counting the moments for ice out. Below is a snapshot from our webcam this afternoon. 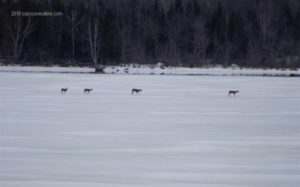 The deer have been traveling out on the ice almost every day. Today I saw 2 groups cross over from Hog Island to the Main land. I hope they stop crossing back and forth once the ice starts to thaw. In 2015, during ice thaw, a few deer fell though and thanks to our fire and rescue, they did save a couple of them. It is kinda hard to believe that the snowmobile trails are still in such great conditions. Reports from local groomers (on the 3rd) as well as Pittston Farm say “they are better then ever.” The rain packed it down a bit and now new snow is expected this week. Some reports say 8-12 inches. Blue Ridge and Summit riders have stopped grooming but our trailmaster in Jackman said as long as the nights are cold enough and people are riding, they will continue to groom until April 14th, as trails here will close on the 15th. Come on up for one last ride! According to the BDN, “Janet Mills signed emergency legislation that allowed Maine Department of Inland Fisheries and Wildlife Commissioner Judy Camuso to adjust the state’s fishing laws to that reality. 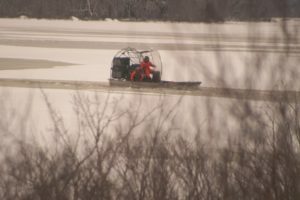 In the northern zone, where ice fishing season was to end March 31, the season has been extended until April 21.” Big Wood is still over 3 feet thick so plenty of time to catch “THE BIG ONE”. Continue to use caution though as things can change quickly this time of year. Come on up, the ice is fine! A snapshot from our webcam this morning. It is a beautiful sunny, cold and breezy day out. The group of riders leaving today had nothing but good reports on the trails in the area. Ryan did over 300 miles yesterday. Reports from surrounding clubs are also pretty good. It’s not too late to get at least another week of awesome riding. The Border Riders Club will continue to groom until April 15th as long as the nights are cold. Time for you all to guess when the ice will go out on Big Wood this year. 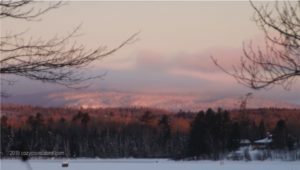 As most of Maine, we had snow in November, and the lake froze over well before season open. As of today, the fisherman are needing an extension on the augers, so over 3 feet thick. We have had a very cold, blowy, snowy winter so far. Today I think it is the warmest at 38. 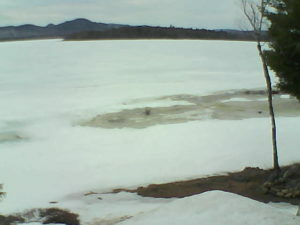 The ice out date last year was May 5th at 4:30 am. Choose your date and time. Choosing a time is helpful if multiple people choose the same date. The person closest to the time will win. Add a comment to this post with your guess. We can only accept one entry per person/email. 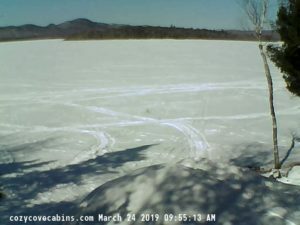 The winning date will be what the Town of Jackman records as the ice out date and time for 2019. The winner will get 50% off one night when they stay with us 2 or more days or 1 full night free if they stay 4 or more days. This discount will expire December 31, 2019. The deadline to post your vote this year is 8am on April 15th, 2019. 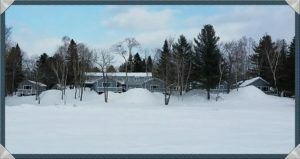 Watch our webcam at www.cozycovecabins.com for signs of change. To add a comment the first time, you do need to register and be approved in order to add comments to any post. Click on register at the top right of Blog Page. Follow directions using the code ccc2017 when asked. Use a simple PW so you do not forget it later.You will then get an email to confirm you are who you are, then I approve that you are not a robot or a “nonAmerican” and you are good to go. After this process, you will need to login to comment but you will not have to wait for me to approve you. Unless of course you forgot your password from before, then you may have to re-register. So don’t forget your password. One of our guests took this for me from the lake. The piles of snow between the camps are so huge, you almost cannot see the camps. I do see blue skies though. 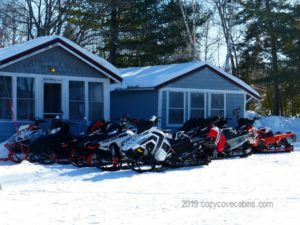 Did you know you can ride your sled from Pittsburg NH to Jackman Maine? These guys did it. They said if you only stop for gas etc, it would be about a 5 or 6 hour ride. Not a bad day I suppose. Of course, nothing is ever that easy. Someone always breaks down. Going home though it was bitter cold with high winds but we were glad they made it home ok.
We have had people ride here from Millinocket, Eustis and even a father son came from Vermont once.